Dr. Stephanie Dalley is a Retired Research Fellow in Assyriology with the Faculty of Oriental Studies at Oxford, and is currently an Honorary Senior Research Fellow at Somerville College and a member of the Common Room at Wolfson College. 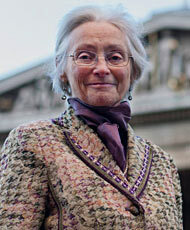 She holds her degrees from Newnham College, Cambridge, and her research interests are Akkadian literature and history. She has published extensively, her most recent book-length work is The Mystery of the Hanging Garden of Babylon: an Elusive World Wonder Traced (2013), and her works in progress include A History of the city of Babylon (Cambridge University Press). Dr. Dalley is an AIA Norton Lecturer for 2015-2016.